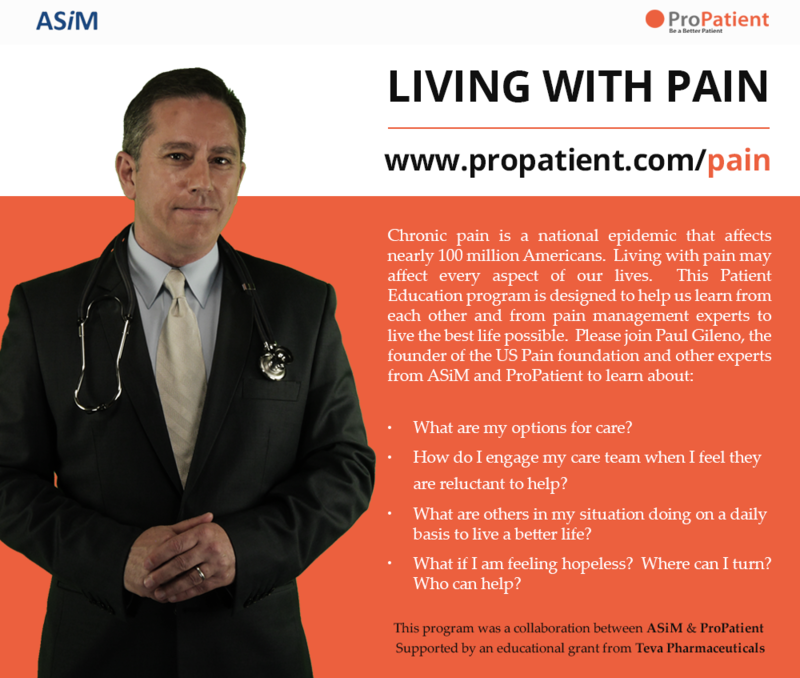 Hillsborough, NC, November 14, 2016	(Newswire.com) - ​​​ASiM, The US Pain Foundation and ProPatient build a novel online resource for chronic pain sufferers. 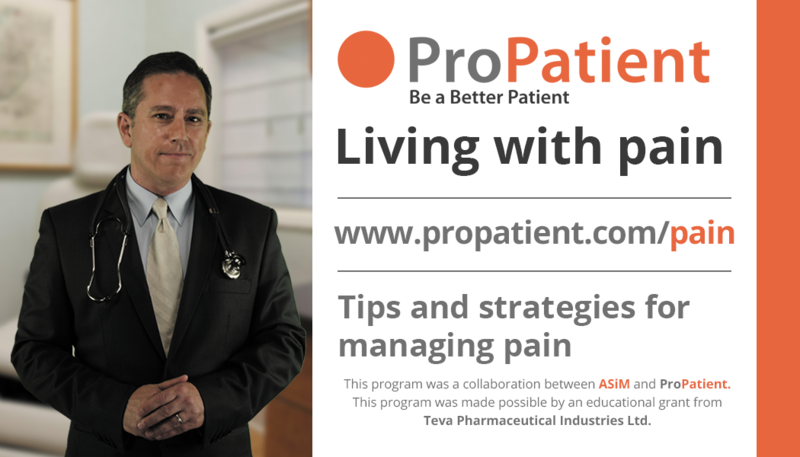 ProPatient, a provider of interactive online patient education tools is teaming up with Advanced Studies in Medicine (ASiM), a full-service medical publishing and logistics company, to establish an innovative, responsive online resource to support people dealing with chronic pain. Chronic pain is an unpleasant sense of discomfort that persists or progresses over a long period. In contrast to acute pain, which is usually treatable and arises suddenly in response to a specific injury, chronic pain persists over time and is often resistant to medical treatments. Chronic pain affects over 100 million Americans. The program includes a guest appearance by Paul Gileno, president and founder of the U.S. Pain Foundation. Gileno created the foundation after a work injury in 2003 left him living with degenerative disc disease, failed back syndrome, and complex regional pain syndrome for over three years. "I created the foundation in hopes of helping those with pain find personal answers that enable them to grow and live once more with meaning and purpose," declared Gileno. Furthermore, he is committed to making sure the public better understands the tolls and trials those with pain endure. U.S. Pain is a 501(c)(3) nonprofit that exists to connect, inform, empower and advocate for the pain community. This grassroots organization continues to grow. It has over 70,000 members and representation in every state. Paul’s story about living with chronic pain and becoming a patient advocate provides a powerful insight into the challenges encountered by those with chronic pain. "My own pain was the catalyst to start the foundation," said Gileno. "You are the expert of your own pain. And you need to speak to your healthcare provider. To do this effectively, you'll need to be able to speak the same language as your doctor, which means expressing yourself in terms that he or she can understand." ASiM is partnered with what are, arguably, among the most acclaimed medical institutions in the world to develop and disseminate exemplary healthcare education. ASiM possesses in-depth knowledge and experience in state-of-the art e-learning applications and publications. "We understand the principles of lifelong learning. We understand the learning cycle. Educational planning is inherent to our processes, including how to assess gaps in knowledge, attitudes, skills, and behaviors," writes President and CEO of ASiM, Jack M. Ciattarelli. This collaborative program entitled, "Living With Pain," explores various treatments, medications available, and methods for managing pain. It also includes strategies and best practices for communicating with one's healthcare provider, and empowers patients to take an active role in their health care. "The resources provided in this program can help you start the conversation so you can speak to your doctor and take control of your pain," writes David Hadden, Co-Founder and Chief Game Changer of ProPatient.